It’s summer. It’s hot — at least, it’s supposed to be, although lately Columbus has been unseasonably cool — so who wants to eat soup? Who wants to spoon down piping hot liquid on a day when the temperature is up around 90? All true . . . but there is one soup that is perfect for the summer. I’m not talking about vegetable-intensive gazpacho, which always looks like a bad excuse to use up the odds and ends from the vegetable crisper drawer in the fridge. No, I’m talking about the premier summer soup: vichyssoise. Vichyssoise, which rolls down your throat like a brisk stream of rich, creamy goodness and cools you to the very core. 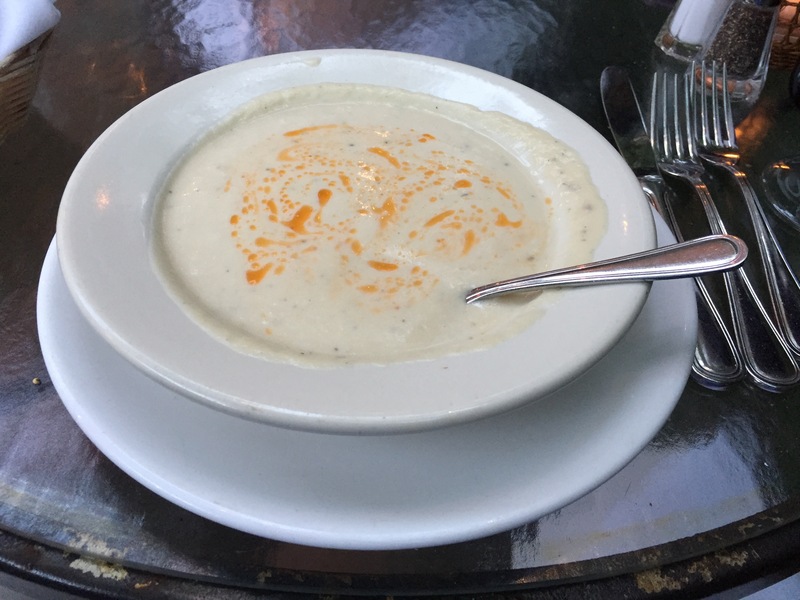 G Michael’s has potato leak vichyssoise on its current summer menu, and it’s just what the doctor ordered on a hot summer’s day. Don’t you love it when you go to a favorite restaurant and see something that perfectly fits the circumstances and your taste buds?